The triangle, as depicted in Close Encounters. Most observers reported five lights. I counted 33 here. The story as told depicts peoples' descriptions of the supposed "triangle," and their reactions to it. The Talking Heads in this segment were David Marler, former MUFON state director for Illinois, and Larry Lowe, described as a "journalist, pilot and witness." Neither is terribly well-known in UFOlogy, although Marler is a scheduled speaker for the forthcoming International UFO Congress near Scottsdale, Arizona, which I will be attending. Marler called this case "unique" because, he said, we have potentially thousands of eyewitnesses. But that means very little. Many people had gone outdoors to watch the bright comet Hale-Bopp, which was then near its greatest brightness. Clearly something flew over Arizona that evening between approximately 8:00 and 9:00, but the number of people who saw it adds nothing to its significance. 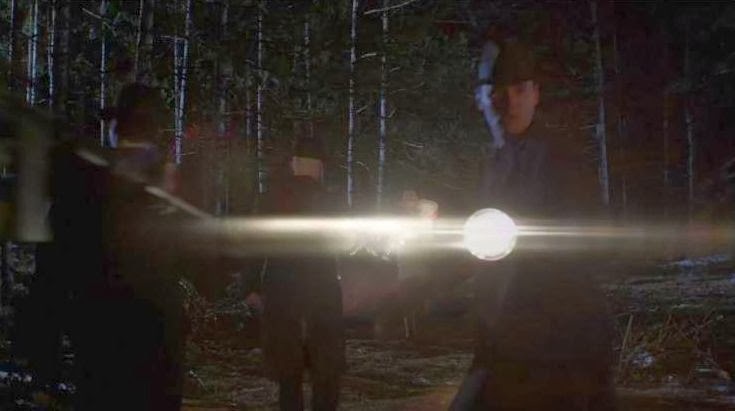 The episode tells of several witnesses' reactions to the strange, noiseless lights. The Johnson family thinks that the object "seems to be sending a transmission" to them, a "personal communication" from whatever "intelligence" is inside the object. Wow! What did all of these people see? As investigative reporter Tony Ortega wrote in "The Great UFO Cover-up" in the Phoenix New Times on June 26, 1997, about three months after the incident, "Scottsdale resident Mitch Stanley knows what the March 13 "UFO" was. But will anyone listen?" Mitch Stanley, then 21, was outside observing with his ten-inch reflecting telescope. Because the Dobsonian mount of his telescope moves flexibly and freely, he was able to examine the lights under magnification. He clearly saw that they were airplanes: “What looked like individual lights to the naked eye actually split into two under the resolving power of the telescope. The lights were located on the undersides of squarish wings, Mitch says.” Stanley tried to give his account to reporters and local politicians who were making big deal out of the sightings, but nobody paid any attention to him, until he finally spoke to Ortega. Later the retired Air Force Major and UFO skeptic James McGaha interviewed Stanley at length. Stanley was not familiar with the appearance of the A-10 aircraft, but the description he gave left McGaha with no doubt that he had seen a flight of A-10 Warthogs, a plane that McGaha worked with at Davis-Monthan AFB. These aircraft are used by Air National Guard units across the U.S. McGaha notes that the A-10 is the quietest jet that the Air Force has, so it is not surprising that many witnesses heard nothing. I was on my way from Flagstaff to Laughlin Thursday when I saw the light formation reported on the radio the other night. I'm a pilot and was in the U.S. Air Force 4 years. Being in the mountains on highway 40, the night was clear and still. As the formation came towards me I stopped my car and got out with my binocs to check out what this was. As it came towards me, I saw 5 aircraft with their running lights (red and green) and the landing lights (white) on. They were also flying fairly slow and in the delta formation. As they went over me I could see stars going between the aircraft so it could not have been one large ship. The flying was like that of the Blue Angels or the thunderbirds demo team. Also as they went by their jets were not very loud because of the low throttle setting for flying slow but I did hear the jets as they went away towards the south. Tim Printy has a great deal of information about this incident in his webzine SUNlite2_3. In fact, there is even a video in existence of the "triangle," taken by Terry Proctor. In its 43-second length it clearly shows the motion of the objects with respect to each other. 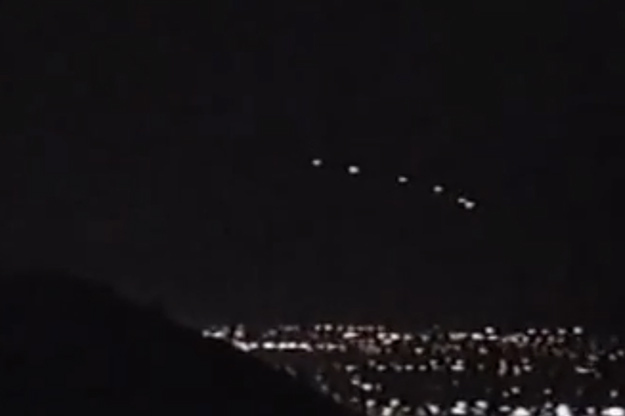 In other words, despite some observers’ impressions, what flew over was not a single solid object, but five unconnected lights flying in formation. four frames from the Proctor video, showing actual positions of the five objects (lines added). Ironically, this screen cap is from a Discovery Channel (U.S.) program, "UFOs Over Phoenix." But what aircraft were they? 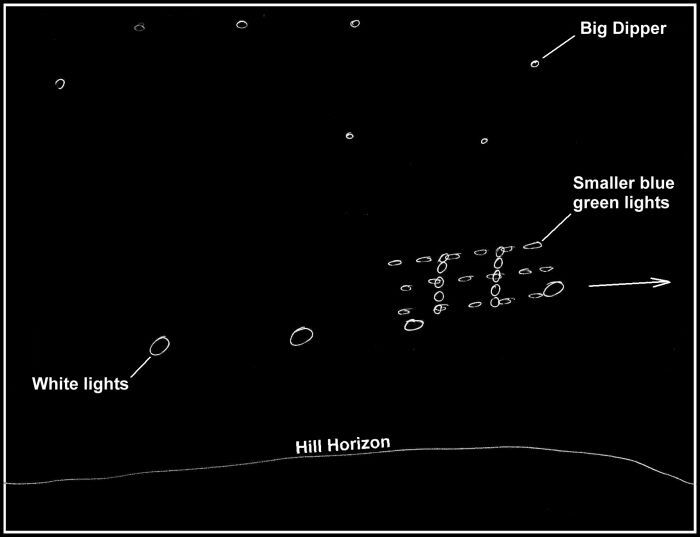 According to a May 1999 Reader’s Digest article by Randy Fitzgerald, "UFOs – A Second Look,"
At 8:30 p.m. the cockpit crew of an American West 757 airliner at 17,000 feet near Lake Pleasant, Ariz., noticed the lights off to their right and just above them. 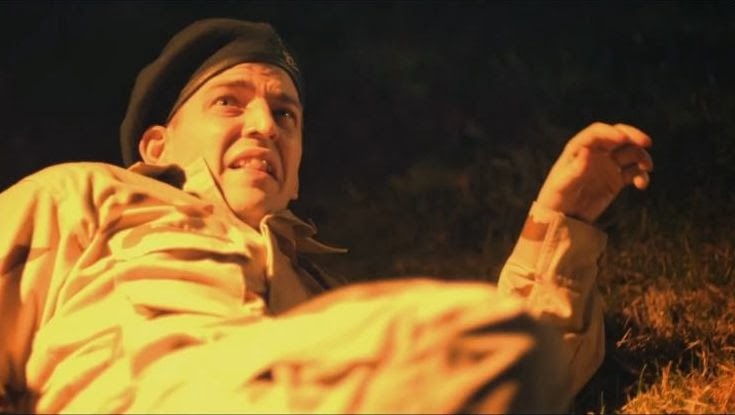 "There's a UFO!" co-pilot John Middleton said kiddingly to pilot Larry Campbell. They queried the regional air-traffic-control center in Albuquerque, N.M. A controller radioed back that it was a formation of CT-144s flying at 19,000 feet. Since there is now no recording of that cockpit conversation, we cannot be sure of the exact words used. But suppose that Middleton, repeating the conversation to Fitzgerald, misremembered the exact words? Perhaps it went something like this: “We’re Snowbirds, we’re headed to Davis-Monthan Air Force Base,” and Middleton then reflected, “Snowbirds, they’re the Canadian Flying Demonstration team.” Because in that case, he would have made a very understandable mistake: he confused two different flying groups that use the same name! Since the 1970s, Davis-Monthan Air Force Base in Tucson has operated a program called Operation Snowbird, which brings in Air National Guard pilots from snowy northern states for winter flying practice. It is operated by the Air National Guard’s 162nd Fighter Wing. This video explains the training functions of Operation Snowbird. Another Snowbird-related video shows A-10s zooming about and even dropping flares. There were several more observers along Interstate 10 as the objects came down lower and approached Tucson, who described them as five separate objects, and not one huge one. The time was noted as 8:42 PM. These were the last sightings of the V-shaped lights. March 13, 1997 was the last night of Operation Snowbird for the year, so obviously any aircraft that had flown off to other destinations, such as Las Vegas, had to return to Tucson. James McGaha reconstructs the story of the V-shaped formation as follows: Five A-10 jets from Operation Snowbird had flown from Tucson to Nellis Air force Base near Las Vegas several days earlier, and were now returning. The A-10 jets were flying VFR (visual flight rules), so there was no need for them to check in with airports along the route. They were following the main air corridor for air traffic traveling that route, the “highway in the sky.” (Why a UFO would follow U.S. air traffic corridors is a mystery.) Because they were flying in formation mode they did not have on their familiar blinking collision lights, but instead their formation lights. In any case, FAA rules concerning aircraft lights and flight altitudes, etc. do not apply to military aircraft. The A-10s flew over the Phoenix area, flew on to Tucson, and landed at Davis-Monthan. A Maryland Air National Guard pilot, Lt. Col. Ed Jones, responding to a March 2007 media query, confirmed that he had flown one of the aircraft in the formation that dropped flares on the night in question. The squadron to which he belonged was in fact at Davis-Monthan AFB, Arizona on a training exercise at the time and flew training sorties to the Barry Goldwater Range on the night in question, according to the Maryland Air National Guard. A history of the Maryland Air National Guard published in 2000 asserted that the squadron, the 104th Fighter Squadron, was responsible for the incident. The first reports that members of the Maryland Air National Guard were responsible for the incident were published in The Arizona Republic newspaper in July 1997. 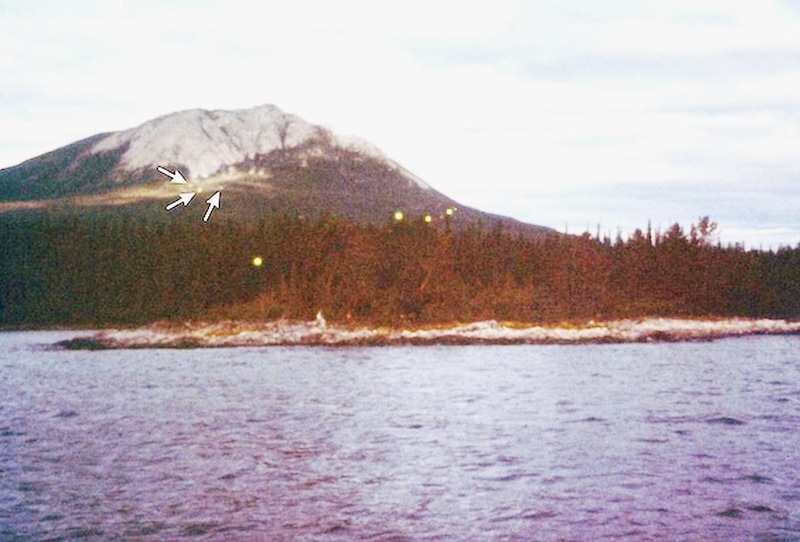 Even many UFO proponents accept that that the video of the second incident - bright lights in a row - was in fact a flare drop, while maintaining that the first incident is still unexplained. But there are still plenty of people arguing that the sightings after 10 PM are unexplained. Dr. Lynne D. Kitei, M.D. isn’t having any of this “flare drop” business. Her website ThePhoenixLights.net says it promotes “Evolution to a New Consciousness.” She claims she was watching the Phoenix Lights two years before everyone else, and that her research proves “we are not alone.” By some complicated analysis she claims to have proven that the objects could not have been flares, although I haven’t run across anyone who understands it. I heard her speak at the 2012 International UFO Congress, and some of her photos of UFOs appeared to me to be lights on the ground. Giving up her practice of medicine to become a full-time UFO promoter, “Dr. Lynne” (as she is sometimes called) has made a documentary film The Phoenix Lights, and has appeared on Coast to Coast AM, the well-known late-night paranormal and conspiracy-fest hosted by George Noory, to tell her tales. When the U.S. Air Force was queried about both incidents, their (correct) initial response was that they knew nothing about them. Both UFO incidents that night involved aircraft of Operation Snowbird, and the Air National Guard has a completely separate command structure from the Air Force. Neither one knows much about the day-to-day activities of the other. Unfortunately, by the time that all of this was pieced together, all records of routine flight operations had been destroyed. But there is very little room for doubt that the famous “V-shaped formation” of lights was five Air National Guard A-10 aircraft flying into Davis-Monthan Air Force Base in Tucson, and no doubt at all that the second incident was a flare drop. Perhaps because March 13 was the final day of Operation Snowbird, the Air National Guard pilots rushed to finish up all of their flying and flare-dropping before it ended! 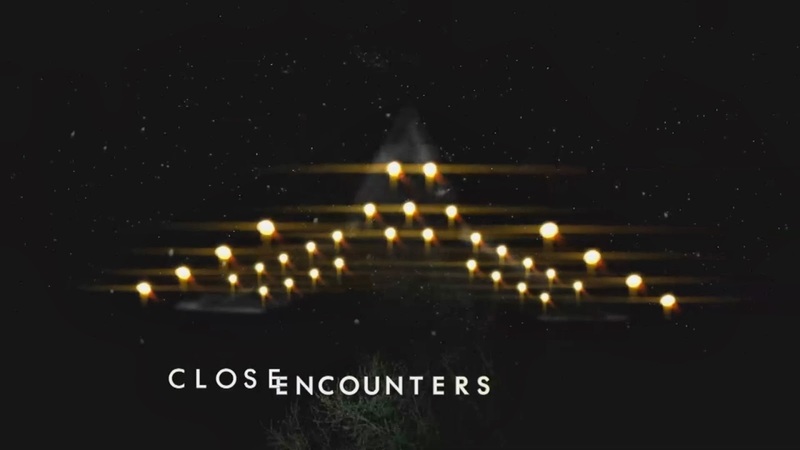 Discovery Canada's "Close Encounters": Mars Mangles Missiles? 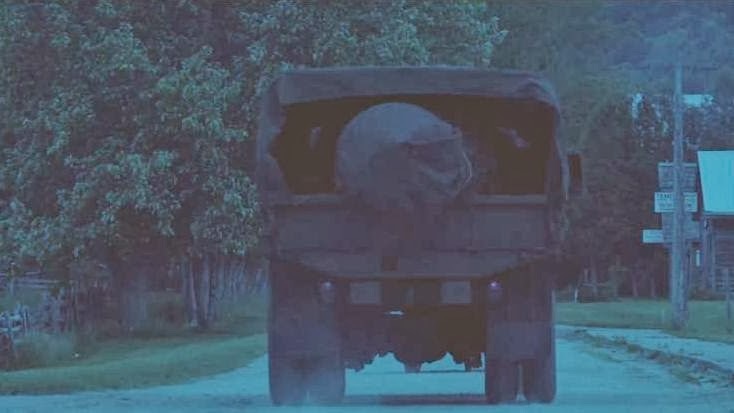 Continuing from the previous posting, the other UFO case examined in the first episode of Discovery Canada's miserable new series Close Encounters was the Oscar Flight incident at Malmstrom Air Force Base in Montana, March 24, 1967. (The name "Oscar Flight" refers to a particular group of ten missiles.) The claims of UFOs supposedly interfering with missiles are complicated and confusing, and I will do my best to un-confuse them. However, the incident as depicted in Close Encounters is a relatively simple one. 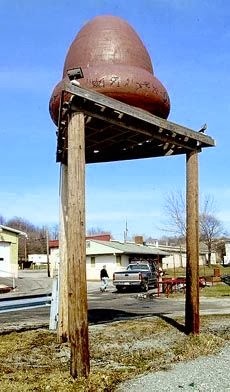 A bright, glowing orange UFO is allegedly seen over the base by security men, and then the Oscar Flight missiles were said to start going off-line, one by one. So let's examine that specific claim. They reported the UFO sighting on their radio. What happened next? According to former Air Force Lieutenant Robert Salas, the main proponent of this case, the missiles started going off-line one by one, a very troubling development to be sure - if it really happened. (In the U.S., UFOs appear to be peaceful, attempting to interfere with nuclear missiles. But according to the Russian-born UFOlogist Paul Stonehill, UFOs in Russia and the former Soviet Union are warmongering, and attempted to launch nuclear missiles.). Security man writhes on the ground, menaced by the planet Mars. The talking heads in this segment were Leslie Kean, and Kevin Randle. 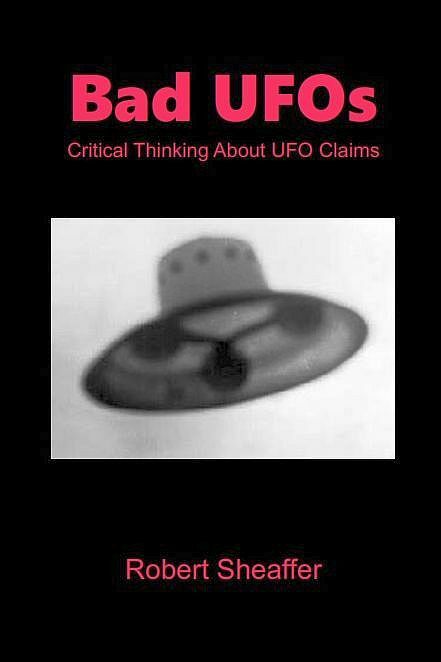 Kean wrote about the supposed Oscar Flight incident in chapter 15 of her book UFOs - Generals, Pilots, and Government Officials Go On the Record (see my review of it, ‘Unexplained’ Cases—Only If You Ignore All Explanations). Since Salas isn't a pilot, and certainly isn't a General, I suppose that makes him a "government official." 1. No mentioning of an incident at Oscar Flight in the 341st Unit History. 2. No mentioning of an incident at Oscar Flight in the engineering and analysis report investigating Echo Flight [incident one week earlier]. 4. No statements supporting an incident at Oscar Flight from those individuals that were either topside at Oscar or in the field responding to a security violation. 5. [Capt.] Eric Carlson [crew commander] and [First Lieut.] Walter Figel [deputy crew commander] discount an incident at Oscar Flight. 6. No one in the chain of command up-channeling reports to 15th AF and SAC HQ has come forward supporting an incident at Oscar Flight. 7. Remote, but possible practical joke played on Meiwald and Salas can not be totally ruled out. As for the Close Encounter narrator's claim that FAA radar detected a UFO over the base on that day, according to skeptic James Carlson (son of Capt. Eric Carlson), while it's true that 'something' was detected on radar, it was more than 120 miles from Oscar Flight (and radars pick up all kinds of things!). The above 7 points may be enough to rule out even a circumstantial case and cast reasonable doubt on any incident occurring at Oscar. But in the end its up to the reader to decide one way or another and ask the all important question..."Did it really happen?" The original documents Salas received state only that "Rumors of Unidentified Flying Objects(UFO) around the area of Echo Flight during the time of fault were disproven.” The loss of the ten missiles that went off of strategic alert was very well documented, as was the investigation that followed, but there has been no mention anywhere that a UFO was reported until Salas’ own claims were made public. There is also no mention of any similar loss of missiles at any other flight on March 16, 1967, or, for that matter, at any other time discussed in any other document published since. ... There were no reports by anybody about anything preceding the Echo Flight shutdown incident, which both Carlson and Figel reaffirmed in September 2010 as well. In 2006, Robert Salas and Robert Hastings adjusted their claims somewhat, asserting that the first report of a UFO came in after the missiles had already started to go off strategic alert, not before, basing this change on an interview conducted with Colonel (Retired) Walter Figel, Jr. Both Carlson and Figel, however, have very clearly insisted that this version of the story is also wrong; both officers insist that UFOs were never reported. This confusion is a result entirely of Robert Hastings’ insistence that the mere mention of the word “UFO”, in the context of a weak joke told by a maintenance technician who was asleep when the missiles startedgoing offline, qualifies as an official UFO report. This theory has no merit whatsoever, primarily becausean actual UFO report would have been forwarded as the signed testimony of the witness for further investigation by the Malmstrom AFB UFO officer, Colonel Lewis D. Chase, as regulations demanded. This did not occur, so very obviously, no report was made. In 1999, Robert Salas readjusted his version of these events once more, insisting that he was not at November Flight when the missiles were taken off of strategic alert, presumably as Meiwald had confirmed three years earlier, but at Oscar Flight. He still asserted, however, that UFOs were reported at both missile sites -- E-Flight and O-Flight – on March 16, 1967, although no UFO sightings were recorded in the region by anybody on that date. There is also no mention anywhere of numerous missiles failing at any time at November Flight or Oscar Flight, whether the result of UFOs or anything else. It’s apparent that Salas was now making claims that had never been convincingly confirmed by anybody. Tim Printy gives us a further examination of claims about Echo Flight in his excellent E-zine SUNlite2_2 and SUNlite 2_3. He, too, shows that UFOs had nothing to do with the missiles at Echo Flight going off-line. So, in the case of Oscar Flight, a UFO was sighted [very likely Mars], but no missiles went offline. In the case of Echo Flight, missiles did go offline due to an electronic glitch, but UFOs had nothing to do with it. I can't un-complicate it any more than that. One Million UFOs are reported each year. [Dubious - MUFON receives less than 10,000]. These are the "Close Encounters"! Well, not really. "Close Encounters" are supposedly those cases where the UFO comes within a few hundred yards of the observer. The problem is, people are quite unable to accurately judge how far away a light in the sky is. The UFO literature is filled with reported "close encounters" with objects whose distance from the observer turns out to be measured in hundreds of miles, if not in millions. The re-entry of the rocket booster Cosmos 2335, as depicted by Discovery Canada. As you can deduce from the above promotional image, the series contains a large amount of re-enactment of supposedly unexplained UFO cases. We saw similar scenes in 2012 in the National Geographic's Chasing UFOs, which ultimately floundered because of the unintentional comedy of its "investigators" stumbling around in the dark with cameras and microphones seemingly hovering over every orifice, and ultimately finding nothing of significance. UFOs are not things that can be chased in real-time. But existing UFO claims can be endlessly re-enacted, and the reenactment can be sexed up to where even the original witnesses would not recognize it. Witnesses do not merely stand and look at a light in the sky. They fall to the ground and writhe while the light in the sky meancingly shines beams at them. 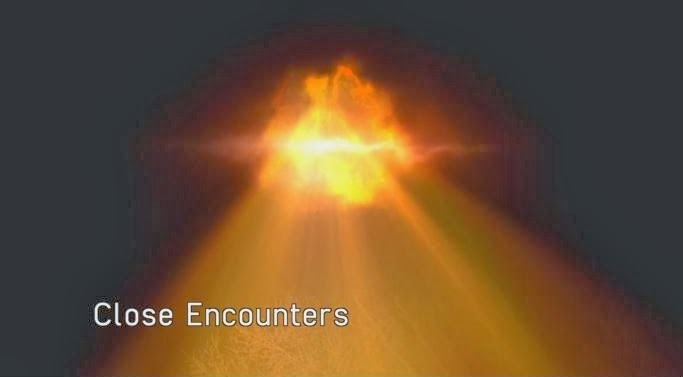 As relief from the heavy drama, Close Encounters gives us talking heads who repeat every pro-UFO claim about the case, completely ignoring difficulties, inconsistencies, and - especially - rational explanations. And what was the first UFO case of the first episode? 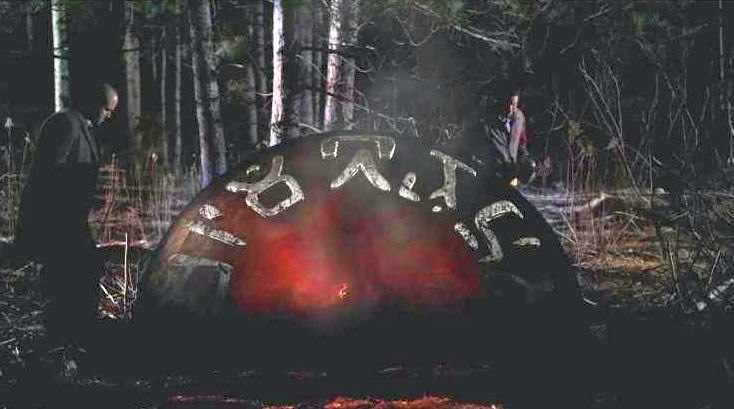 Believe it or not, they chose the now-embarrassing 1996 "Yukon UFO" whose definitive explanation by Ted Molczan, Harro Zimmer, and James Oberg was published in this Blog nearly two years ago, on April 30, 2012. If you Google "Yukon UFO," that is the first page to come up. This Discovery Canada episode was filmed in March of 2013, so they can't say that they didn't know about the explanation. Before that explanation was published, space journalist and author James Oberg sent a courtesy note to Stanton Friedman, the "Flying Saucer Physicist." Oberg outlined the solution, and asked Friedman whether he wanted to reconsider his earlier strong endorsement of the case. Friedman's reply was clear and succinct: NO WAY JOSE. I won't repeat the details of the case here - you can read it in the linked Blog entry - but the supposed "close encounter UFO" reported by the observers matches up exactly with the flaming re-entry of the rocket booster that placed the Cosmos 2335 satellite into orbit earlier that day. There is no possible doubt that this identification is correct. Ted Molczan is widely considered to be the top civilian authority on satellite observations and orbits. He is a major contributor to the satellite observing group SEESAT, containing the most serious and exacting satellite observers in the world. Harro Zimmer, another satellite expert, re-computed and refined Molczan's orbital calculations, and reached exactly the same conclusion. 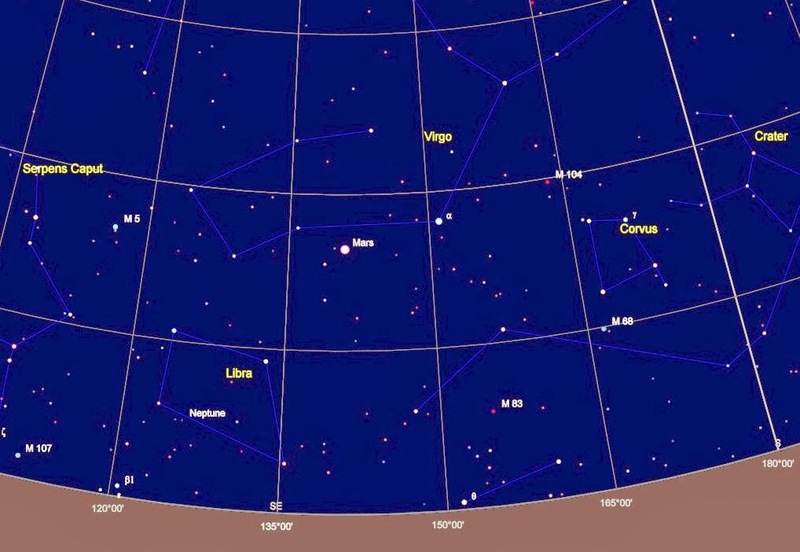 One of the observers drew the "UFO" passing under the Big Dipper, from left to right. Molczan's software drew the path of the decaying rocket booster, as seen from that location. It was exactly the same! Case Closed. 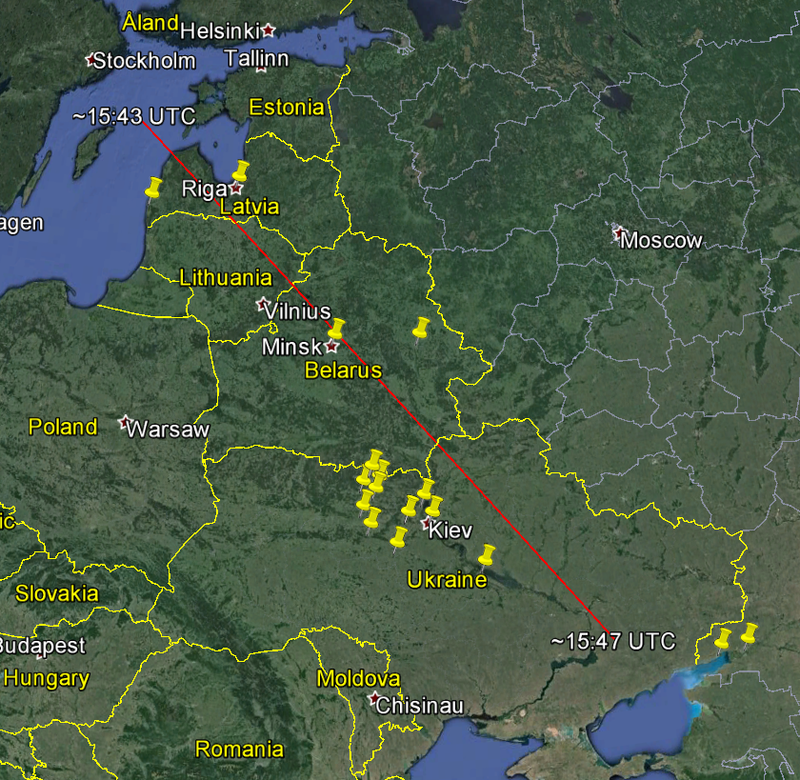 ...we know for certain that the Russian rocket booster body was right where the witnesses said they saw their UFO. 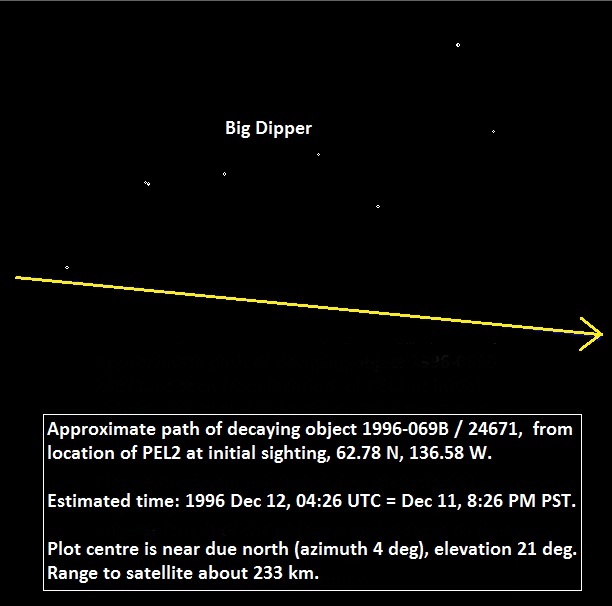 The drawing of the UFO passing under the Big Dipper, left to right, matches exactly the calculated path of the flaming booster. If a UFO was also present, then two bright objects should have been reported, not one. Knowing how unreliable eyewitness testimony often is, it makes much more sense to attribute discrepancies to witness fallibility, guided by preconceived ideas about what UFOs are like, than to assume that a "real UFO" miraculously appeared at the same time and place as the flaming rocket body. Chris, I'm going to elaborate on Robert's point: to suggest as you did that 'some' of the witness reports could be attributed to the simo reentry apparition is to require the 'UFO doppelganger effect' -- a TRUE UFO chose the reentry event opportunity to fly along the same path at a much lower altitude and speed, while also perfectly blocking its witnesses from ALSO observing the ongoing satellite reentry. Gribble expressed this hypothesis in the MUFON Journal about a 1987 reentry which seems to have sparked a vivid CEIII event that he wanted to believe. To call this merely a ''stretch" is to reinvent Spandex. When you seriously study the range of witness misperceptions from other documented reentries -- as Molczan and I have done, see www.spaceobs.org -- you find there is NO witness perception to the Yukon event that does not have precedents in reports from earlier reentries. Of course that does not PROVE that Yukon wasn't different from every earlier reentry witness testimony, but it diminishes the likelihood substantially. We should also point out that Rutkowski's and Jasek's approach to testing the reliability of the eyewitness testimony starts with Step #1: "Assume the testimony is reliable." I can't make this kind of stuff up. 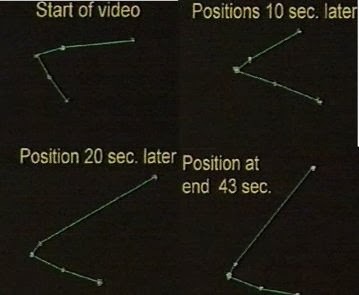 As Ted has already pointed out in detail, for example, the 'triangulation' approach to proving the object was nearby relies on implicitly assuming the object was nearby and 'overhead' as described by a witness, despite numerous instances from the case studies I've prepared in which people [who see the apparition high in the sky and think it's nearby] reasonably extend to it the vague description "overhead". 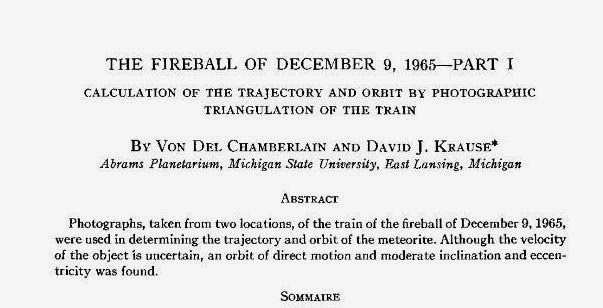 How many times does that have to be shown to be 'the rule' rather than 'the exception' for bright fireball swarms even at lower elevation angles below 30 degrees? The absurdity is compounded by the fact that Molczan is Canadian, and lives right in Toronto, where the episode was filmed. He remarked, "they could have had my input for the cost of cab fare." But of course Discovery Canada had no interest in that. Not a hint of questioning or doubt appears in the episode. Sensation and ratings are the only goal, and troubling facts are things to be ignored. This is Tabloid TV at its worst. The once-factual Discovery Channel has now joined the purveyors of entertainment masquerading as documentaries. For some reason, in the first few days of this new Year, skeptics on Facebook seem to be gushing all over claims about supposed "earthquake lights," supposedly caused by piezo-electric effects of rocks being squeezed by seismic forces. Such lights, it is said, might explain many reports of UFO sightings. "his 1975 Tectonic Strain Theory (TST) of how geophysical variables may correlate with sightings of unidentified flying objects (UFOs) or Marian apparitions. Persinger argued that strain within the Earth's crust near seismic faults produces intense electromagnetic (EM) fields, creating bodies of light that some interpret as glowing UFOs or The Virgin Mary. Alternatively, he argued that the EM fields generate hallucinations in the temporal lobe, based on images from popular culture, of alien craft, beings, communications, or creatures." Persinger's "correlations" between earthquakes and anomalous sightings were so loose that minor earthquakes hundreds of miles away, months previously, could be cited as causal factors. Elsewhere on the UFO front, geophysicist John S. Derr got much public attention this past April when he told the Seismological Society of America that some UFO sightings may be caused by impending earthquakes. 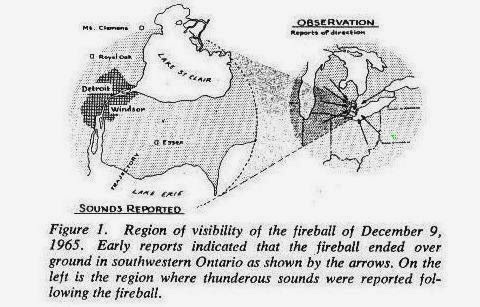 Tectonic strain, says Derr, may cause luminous phenomena, known as earthquake lights, which can be manifested as a strange glow in the sky or even as mysterious-looking balls of electricity that float in the air near fault lines. Working from a computerized list of UFO sightings, after supposedly eliminating objects that were explainable in other terms, he claims to have found a correlation linking UFO sightings with the epicenters of future earthquakes. More than twenty years have passed since this claim was made, and yet the proof still eludes us. A claim is made, and one blogger copies another, who copies another, etc., each imagining that they are contributing something to the world's store of knowledge (but in reality are just doing this to get a few bucks from some on-line publisher). This is to be expected - but what's troubling is when skeptics plunge in to this, whole hog, without the least hint of proper skepticism. (I won't mention any skeptics' names - not this time). This story contains a few 'red flags' that should have been caught by an experienced skeptic. For example, one of the papers cited in support of the hypothesis is from the Journal of Scientific Exploration, a non-skeptical publication that typically runs articles supporting fringe science claims. Kendrick Frazier, the editor of The Skeptical Inquirer, wrote that "The JSE, while presented as neutral and objective, appears to hold a hidden agenda. They seem to be interested in promoting fringe topics as real mysteries and they tend to ignore most evidence to the contrary. They publish 'scholarly' articles promoting the reality of dowsing, neo-astrology, ESP, and psychokinesis. Most of the prominent and active members are strong believers in the reality of such phenomena." 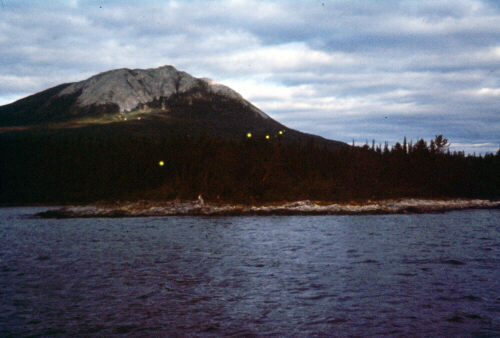 At the beginning of the 70’s, around 10 am on a Canada Day (1st of July) long weekend, a couple boating on the Taku Arm of Tagish Lake, southern Yukon, saw 7 yellow luminous globes on the nearby flank of Lime Mountain... in the early 70’s, the only years when Canada Day occurred on a weekend is in 1972 and 1973. In both years, a strong earthquake happened in July. OK, an earthquake occurred that month. Good enough. Of the two, the most likely candidate that could be linked with the observed globes of light is the Cross Sound earthquake (ML 6.7), as it happened on the 1st of July 1973 at 06h33 LT, hence just a few hours prior to the EQL sighting (if we assume that the latter were effectively seen on that day). This earthquake was followed the same morning by two aftershocks, first an ML 5.2 earthquake at 08h12 LT, followed by a ML 4.1 earthquake at 09h03 LT (AEIC, 2012). If we accept the best-case result (1973), the epicenter of that undersea earthquake was approximately 160 miles from where the photo was taken, 3 1/2 hours later. I changed the contrast & brightness on that photo (no photoshopping). That bottom light is in front of the trees! Oops. Also we picked up two more small lights on the right. I don't know what these little orbs are, but they sure as hell are not "earthquake lights"! Other photos presented as supposed "earthquake lights" are even more obviously bogus. Supposed "earthquake lights" seen in San Diego, several weeks after an earthquake! Compare that photo to this one, properly labeled on the Weather Underground as an iridescent cloud! 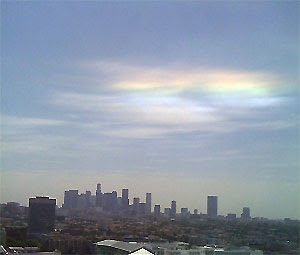 Compare the photo from Chile to this one, properly labeled "iridescent cloud"! In each case, red on the top, blue on the bottom. Go to Google Images, and enter "iridescent clouds." You will see plenty of images like these, a phenomenon related to the colors seen in soap bubbles. 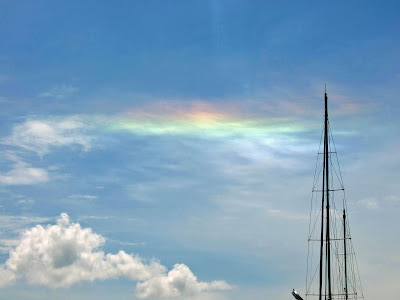 Also check Wikipedia, "Cloud Iridescence," for more. Apparently checking Wikipedia, or doing any research, is too much trouble for supposed "science bloggers." Or for many "skeptics." In 2007 the excellent Blog Forgetomori, from Brazil, posted a story about possible earthquake lights in Peru, followed soon afterward by the suggestion that these were very likely flashes from electrical transformers shorted out by the earthquake. Frankly, they look like they could also be lightning flashes. It's truly remarkable how mutable "earthquake lights" are. Sometimes they look like small globes, climbing up a mountain. Sometimes they look like flashes of lightning. Other times they look exactly like iridescent clouds. Earthquake lights can look like anything at all, when you are avidly seeking evidence for them. I'm sure that you can find more. Nor am I denying that there are likely as-yet unexplained phenomena associated with earthquakes. In fact, I will tell you about one. To the reader this is, of course, an anecdotal account, but I know it to be accurate. In April of 1984, I lived in the Silicon Valley, working in an office on the northeast side of San Jose, on Berryessa Road, east of First Street. On April 24 I went out for a walk after eating lunch, as I often did. There was a seldom used, perhaps totally unused, railroad track crossing nearby. Suddenly, I heard the railroad crossing signal alarm start up. I had never seen any train go by there, so I walked quickly toward it to see the train. I arrived there - and there was no train. Very curious, I thought. As I continued my walk, I felt myself swaying and I thought I must be having an unexplained dizzy spell. Then I saw that nearby buildings were being evacuated, exactly as I had done in drills. I realized that we had just experienced an earthquake. At 1:15 PM, the Morgan Hill earthquake, magnitude 6.2, had struck. The epicenter was in the mountains east of San Jose, no more than about ten miles from my location. Apparently, some sort of pressure wave from the soon-to-erupt earthquake had triggered the railroad crossing signal. How much time had elapsed from the triggering of the crossing alarm to the earthquake? I cannot say for sure. It was not a long time, but more than a few seconds. I had time to walk to the crossing, stand there puzzled for a bit, then continue my walk. I would estimate the interval as perhaps two minutes. For several years, I lived in a house whose back yard faced a mountain where, in the valley on its other side ran the San Andreas Fault no more than two or three miles away. I would often go outside to look at stars, but I never saw any earthquake lights. I figure that if they would be seen anywhere, they would be seen there. Not some place hundreds of miles from a fault.